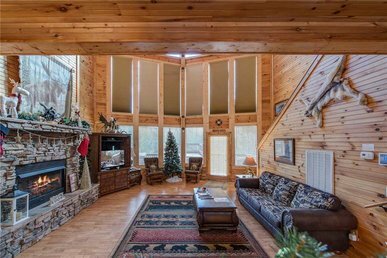 Because Rocky Top Lookout is only a mile from Rocky Top Sports World, it’s a great choice of lodgings if you’re in town for a sports tournament. 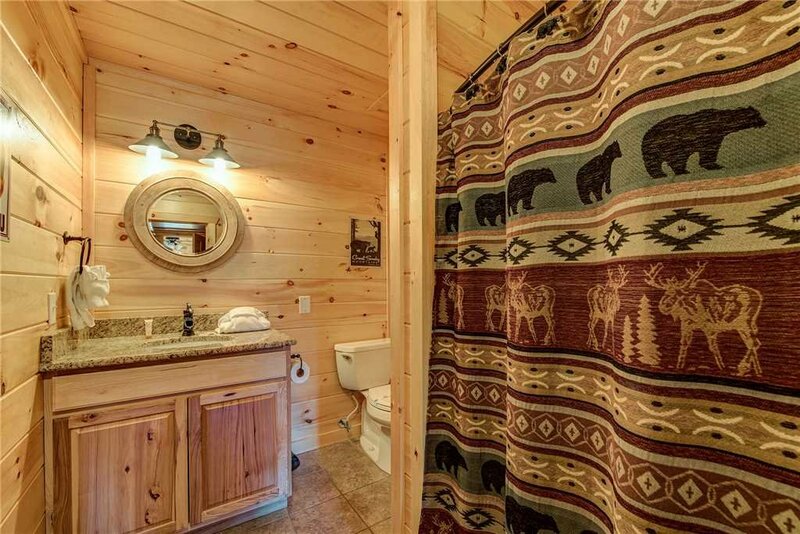 Then again, it’s a great choice if you’re visiting the area for any reason. 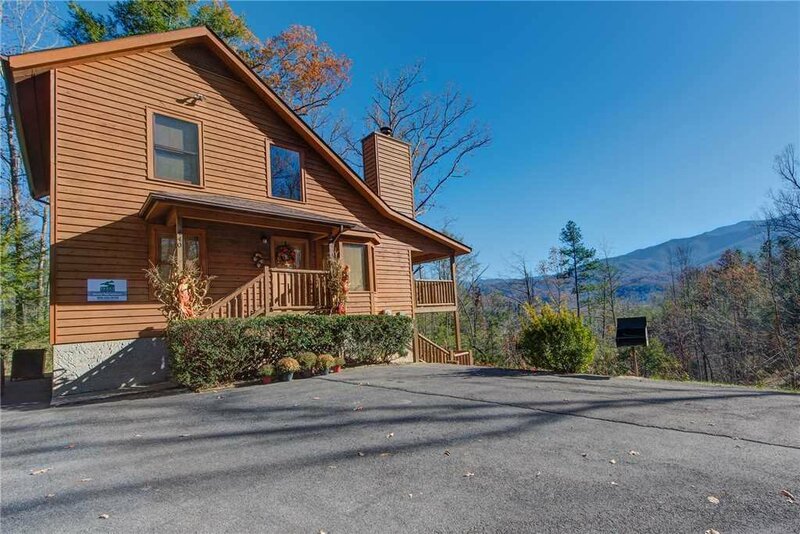 The 4-bedroom log cabin is packed with amenities, offers awe-inspiring views of the Great Smoky Mountains, and is just a short drive to the local attractions. 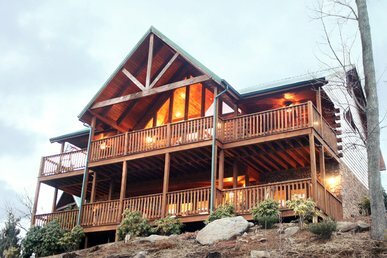 Rocky Top Lookout was renovated from top to bottom in spring 2016, so just about every aspect of the cabin sparkles, glows, or gleams. 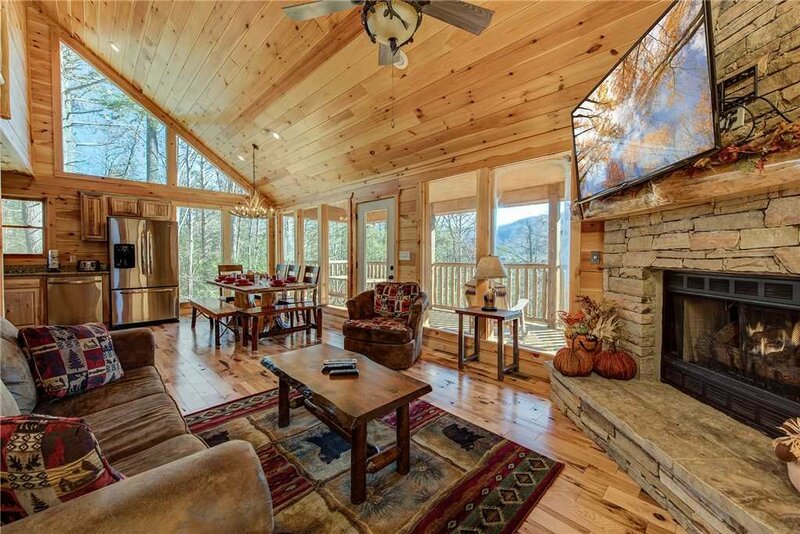 The oversize windows of the open-plan living/dining/kitchen area let in plenty of sunshine to show off the burnished wood-planked floors, walls, and ceilings. 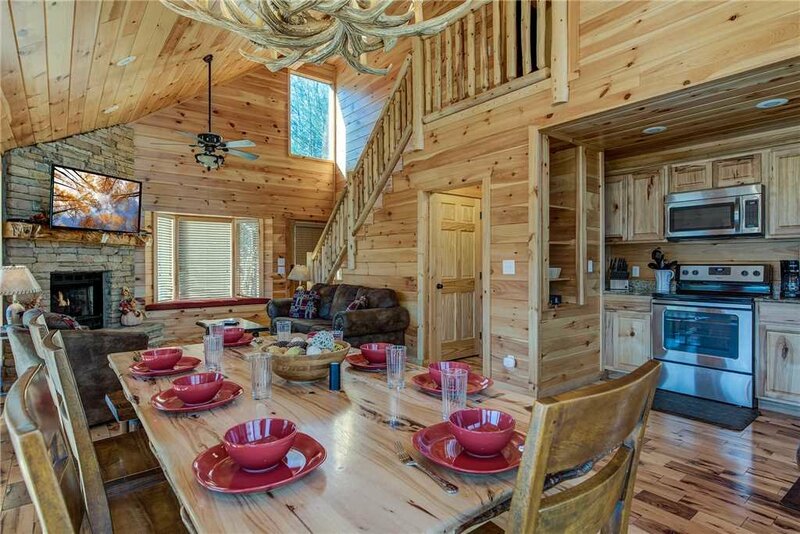 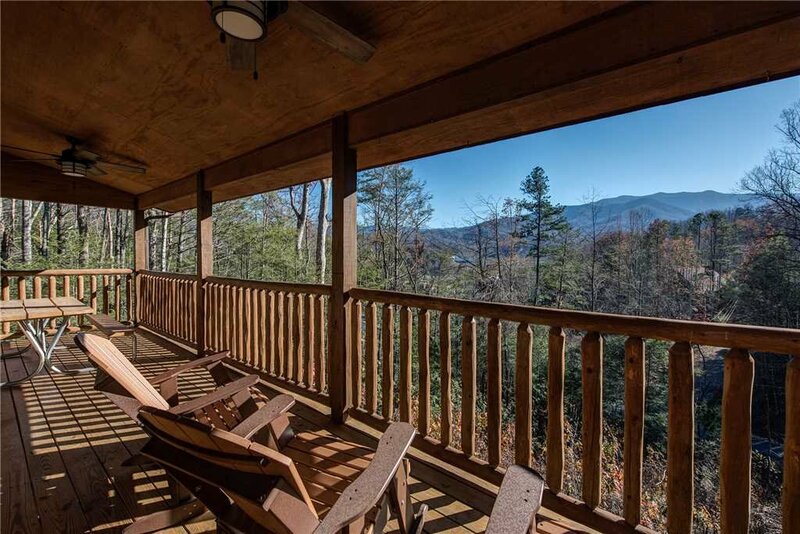 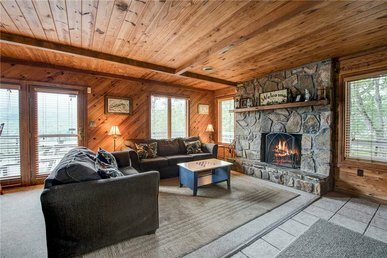 They also enable you to relish the views of Mount LeConte and the old-growth woodlands even as you sprawl out on the living room sofa or sit down to eat at the dining table. 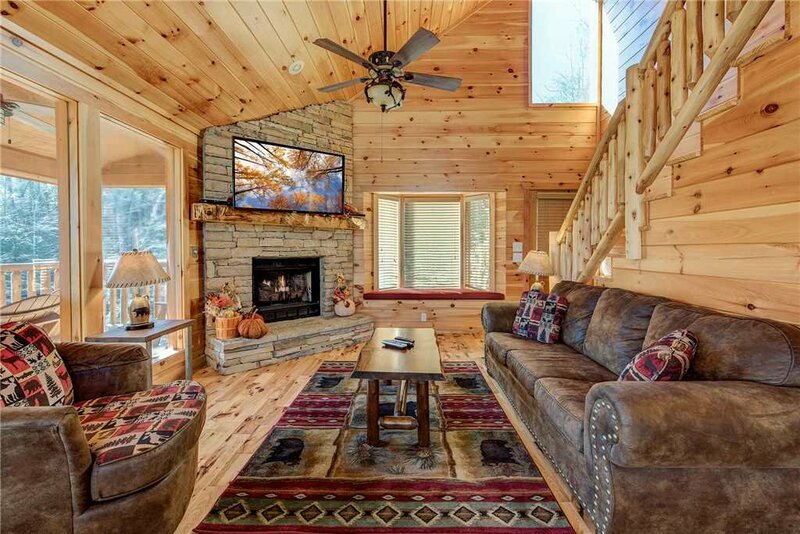 A fireplace adds a golden glow and warmth to the space in winter; in summer the ceiling fan brings a welcome breeze. 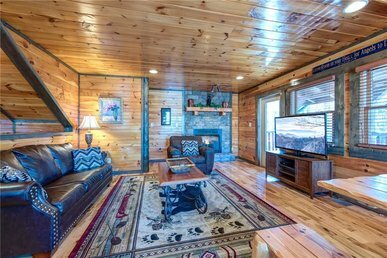 The living area has a 55” flat-screen TV, but if you want to view the big game or a favorite movie, you might want to head downstairs to the home theater. 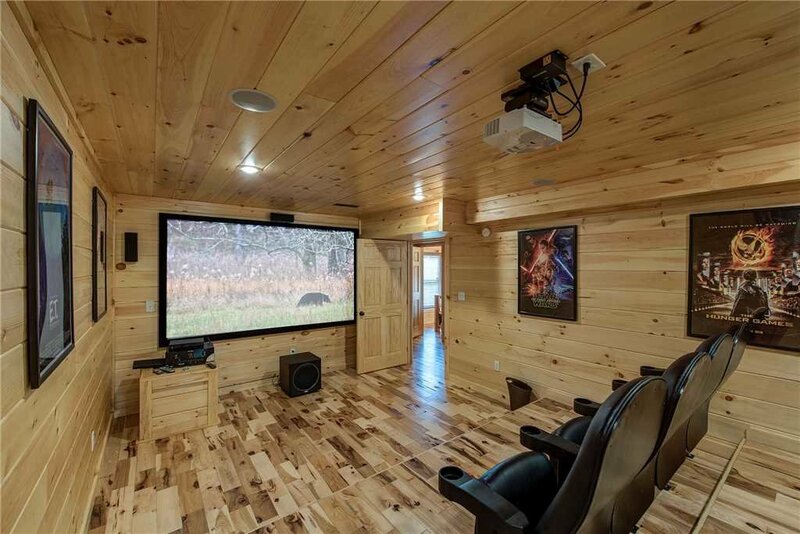 The screen is huge—120”—with 7.1 surround sound and a web-enabled setup with cable channels and Blu-ray. 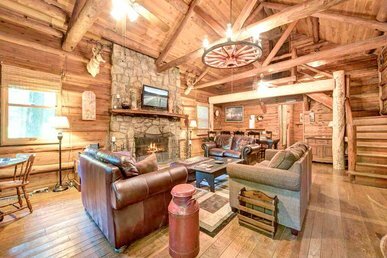 Ten people can kick back in its theater-style seats. 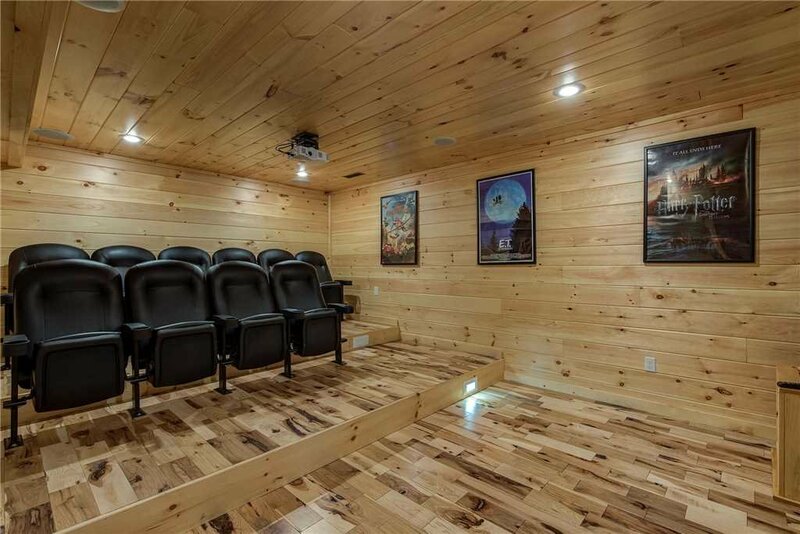 After watching a movie here, you may never want to go to your local cinema again! 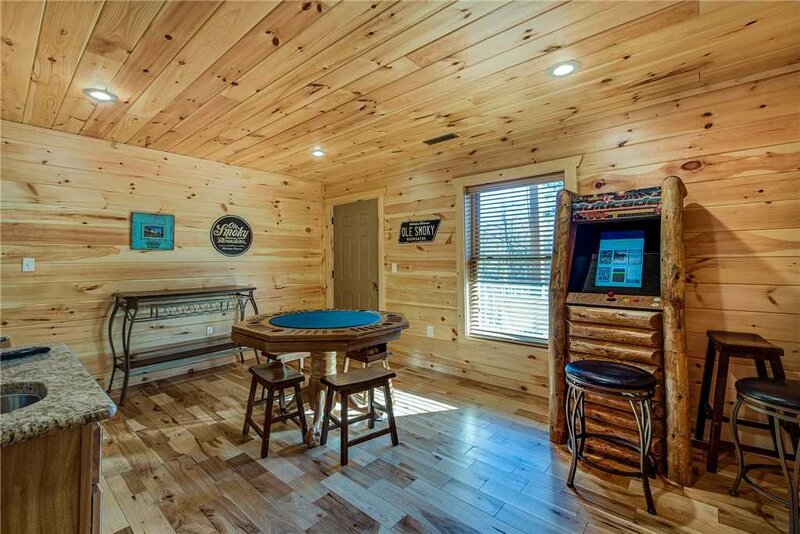 Downstairs also has a game room with its own TV, plus bumper pool and a multigame arcade. 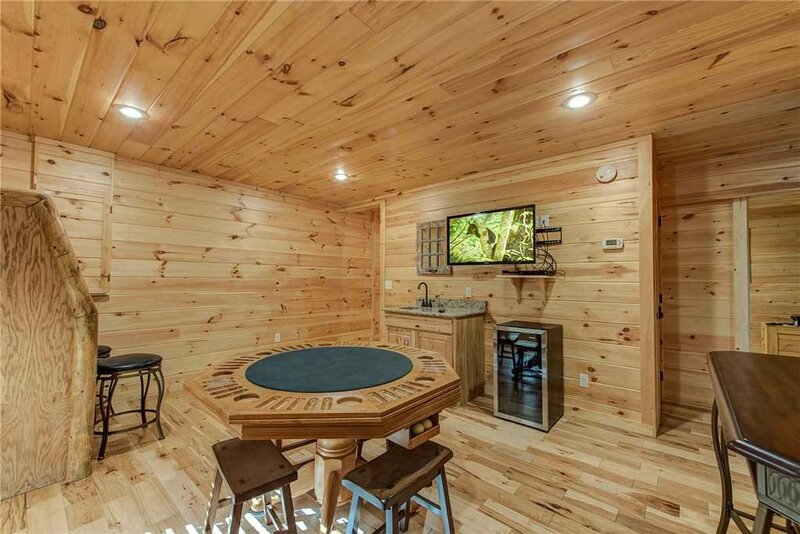 Should you work up a thirst while playing, you can grab a drink from the game room’s wet bar with mini fridge, rather than run upstairs to the kitchen. 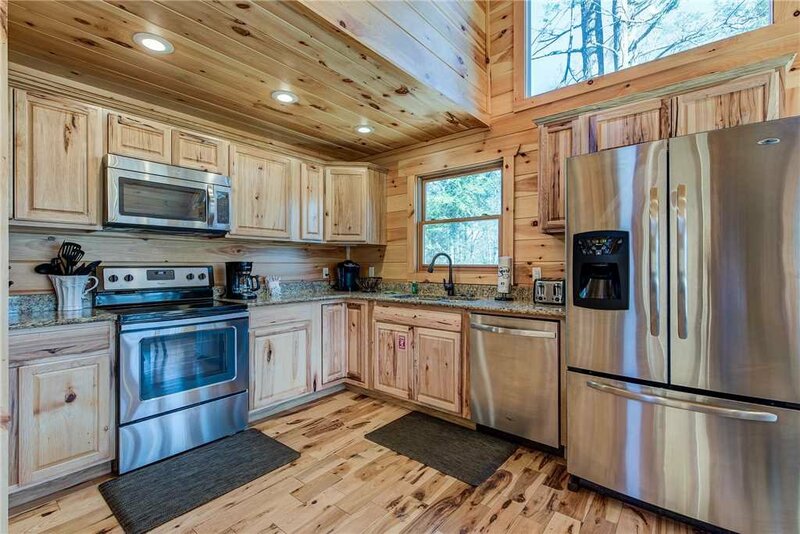 Speaking of the kitchen, it’s as pristine as the rest of Rocky Top Lookout, from the stainless-steel appliances to the ample counter space. 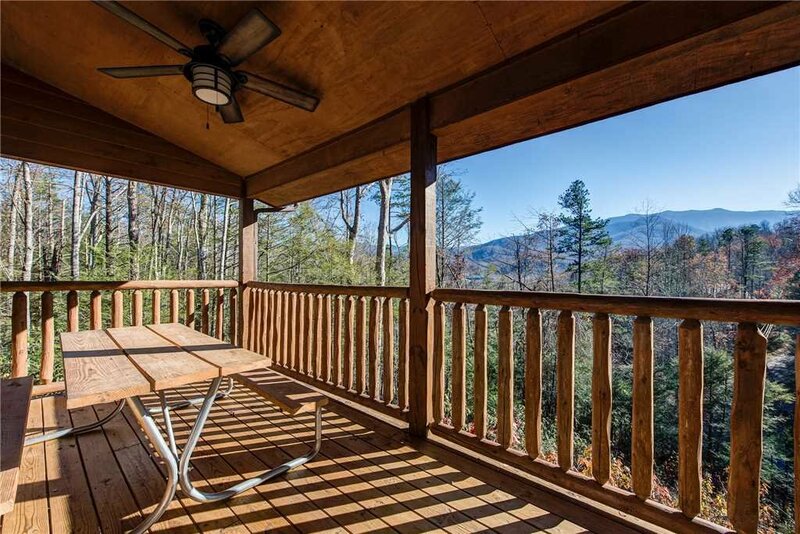 If you’re in the mood for barbecue, you can use the park-style charcoal grill right outside. 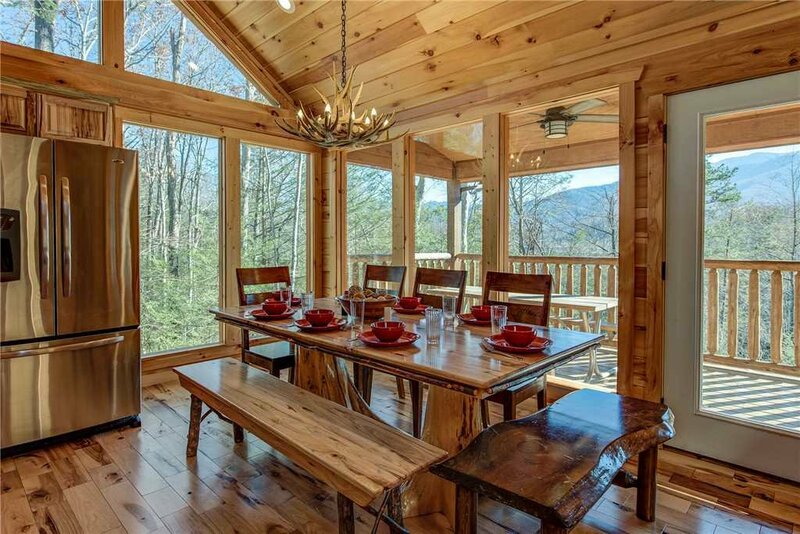 You can dine outside too, at the picnic table on the main level’s covered deck. 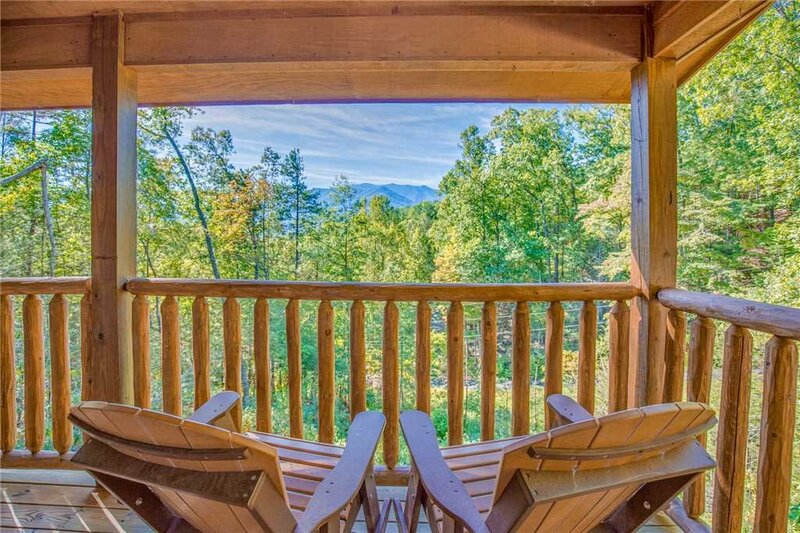 The sight of falcons soaring over the Smoky Mountains and the sound of the fresh breeze whispering through the towering trees will make even the simplest meal seem like a feast. 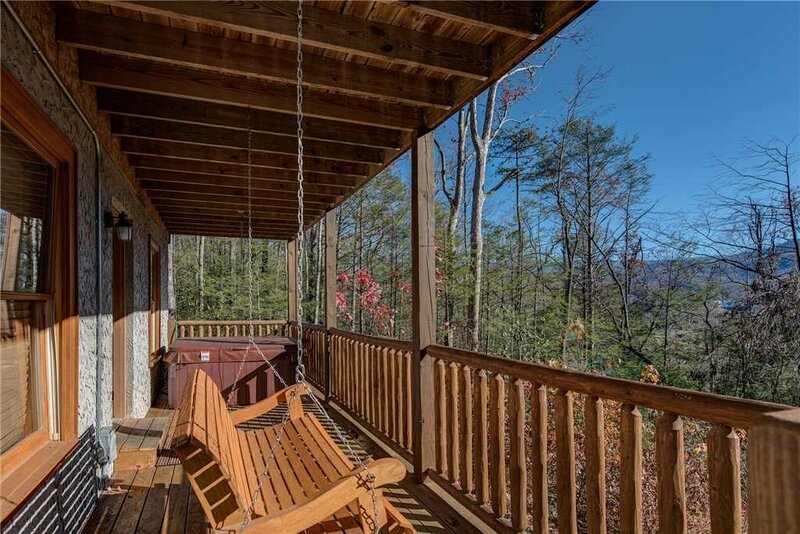 The decks have plenty of rocking chairs as well, so that you can listen to chickadees and larks greet the day and enjoy stargazing while tree frogs and crickets serenade at night. 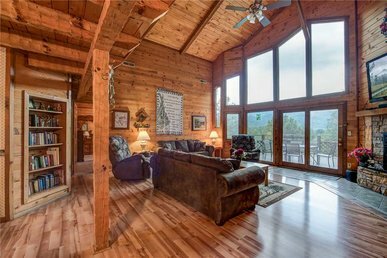 Ceiling fans make the deck a cool place to revel in the view even during a hot summer day. 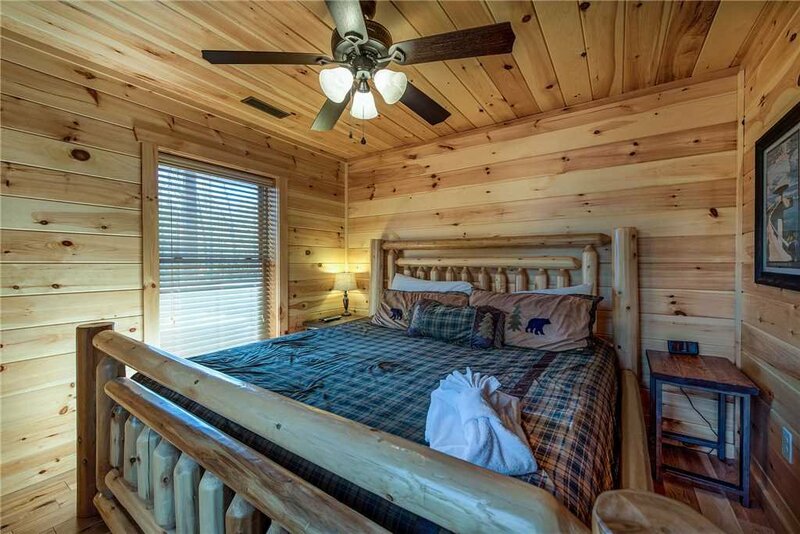 All 4 of Rocky Top Lookout’s bedrooms are designed with comfort and relaxation in mind. 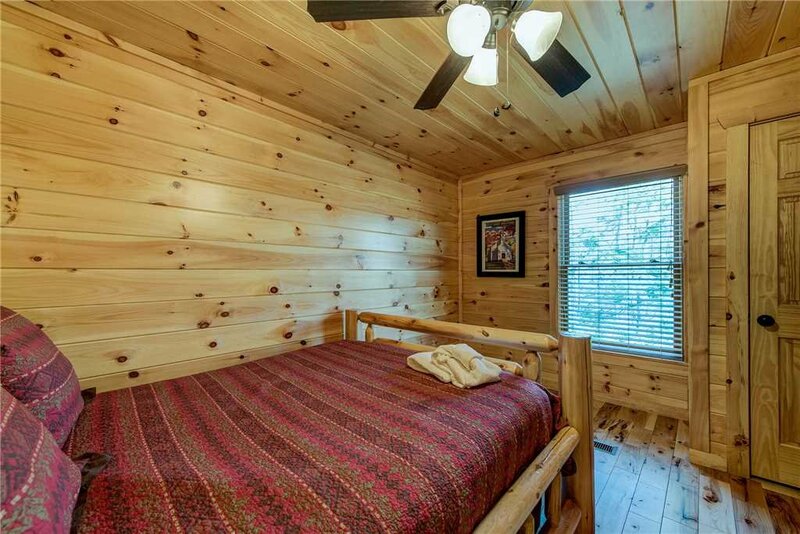 The downstairs bedroom includes a king-size bed. 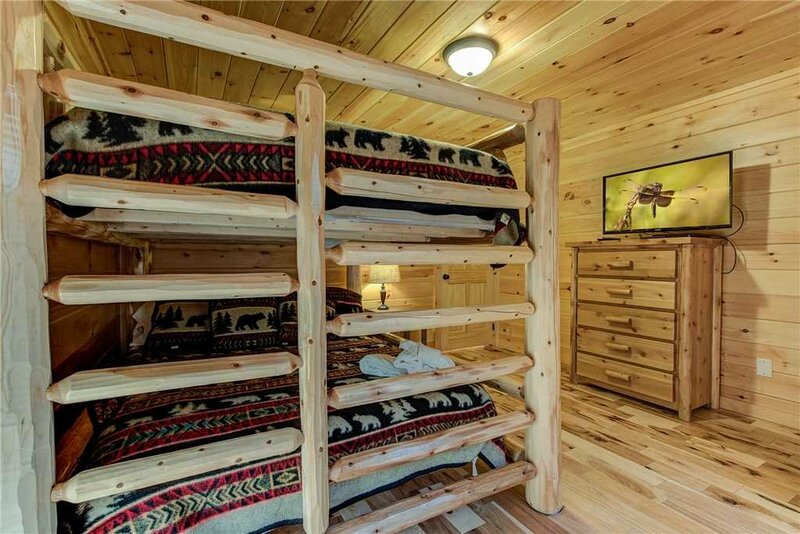 One of the upstairs bedrooms features a queen-size bed, while the 2nd upstairs room has queen-size bunk beds, so that 4 people can sleep there. 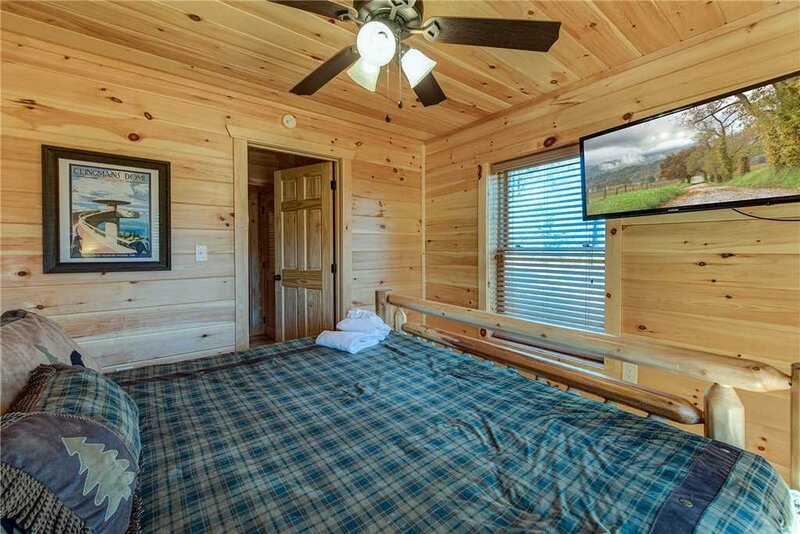 Each room has its own flat-panel TV. 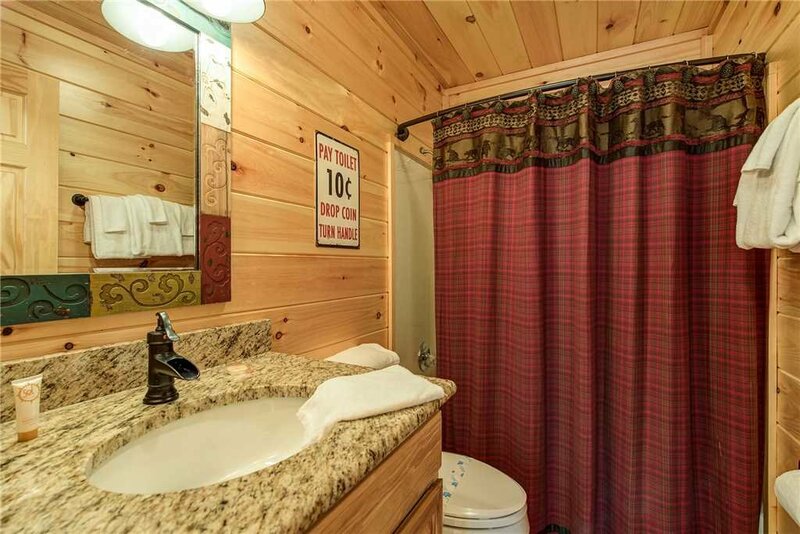 The master suite, however, is especially luxurious. 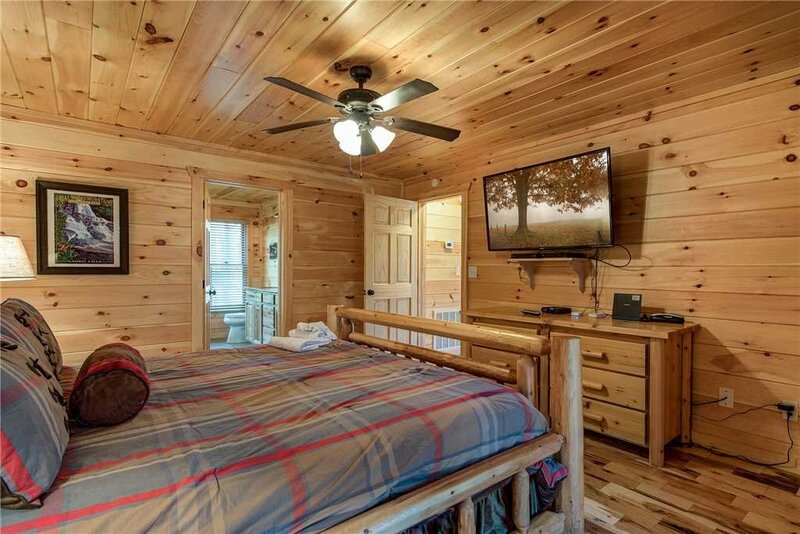 Located on the main floor, it includes a king-size bed and a 55” web-enabled flat-screen TV. 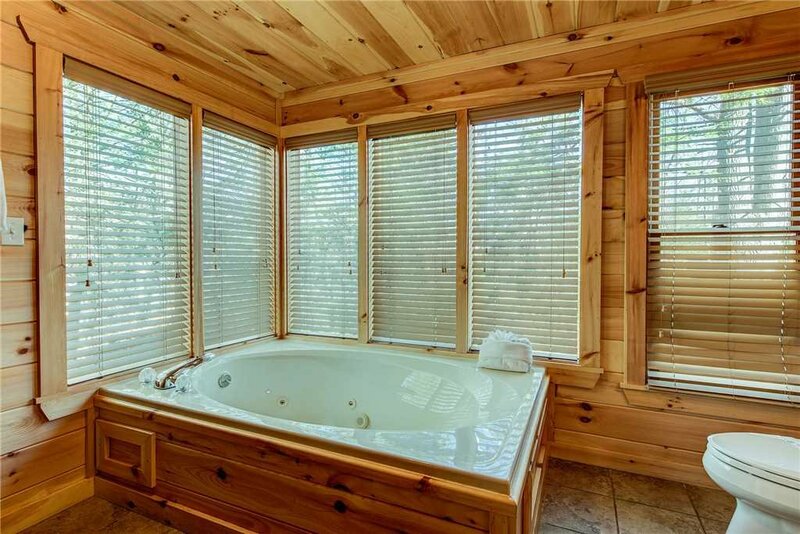 Perhaps best of all, its spacious en-suite bathroom boasts a roomy jetted tub and a wall of windows so that you can bask in the view of the lush woodlands while you bathe. 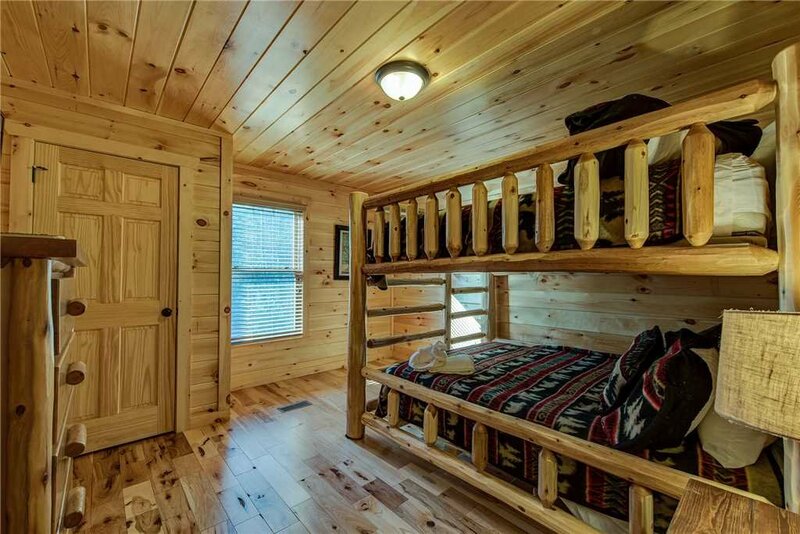 Rocky Top Lookout’s other amenities include free WiFi, a washer and dryer, a full bathroom on each floor, and a sofa in the living area that opens into a queen-size bed, enabling the cabin to sleep 12 people in all. 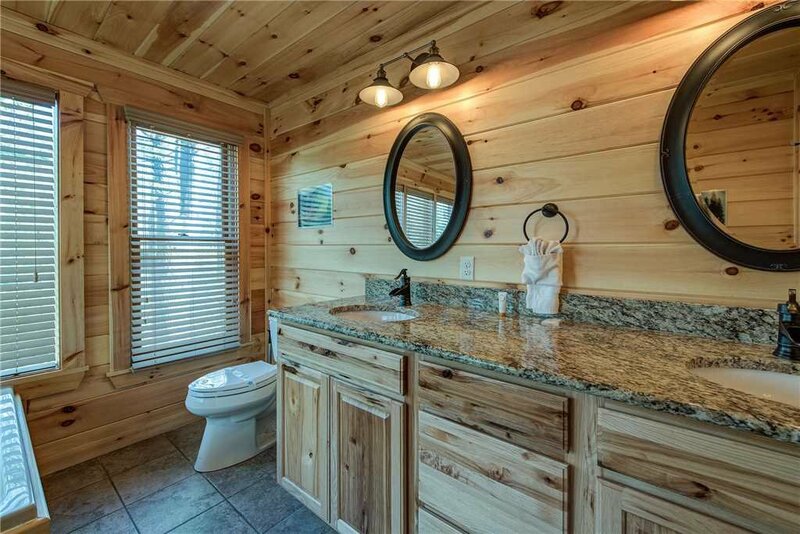 Its best amenity, though, might be its convenient location. 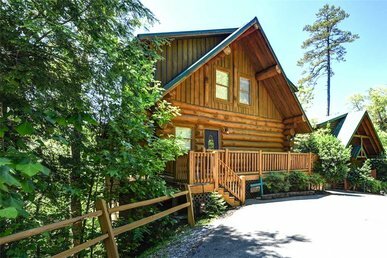 As well as being just a mile from Rocky Top Sports World, the cabin is only a mile from the Gatlinburg Arts & Crafts Loop, an 8-mile trail of more than 100 galleries, studios, and shops. 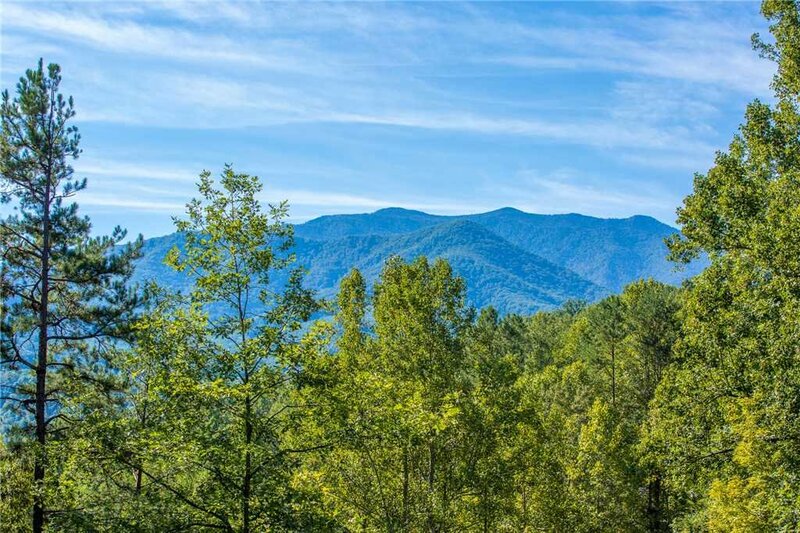 Less than 15 minutes away is the Great Smoky Mountains National Park; ditto downtown Gatlinburg, home to an aquarium, thrill rides, the Guinness World Records Museum, mini golf, restaurants, and more. 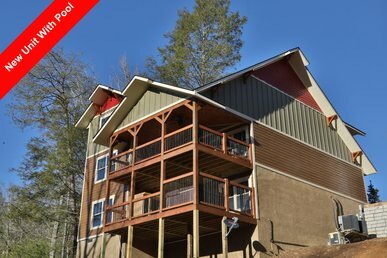 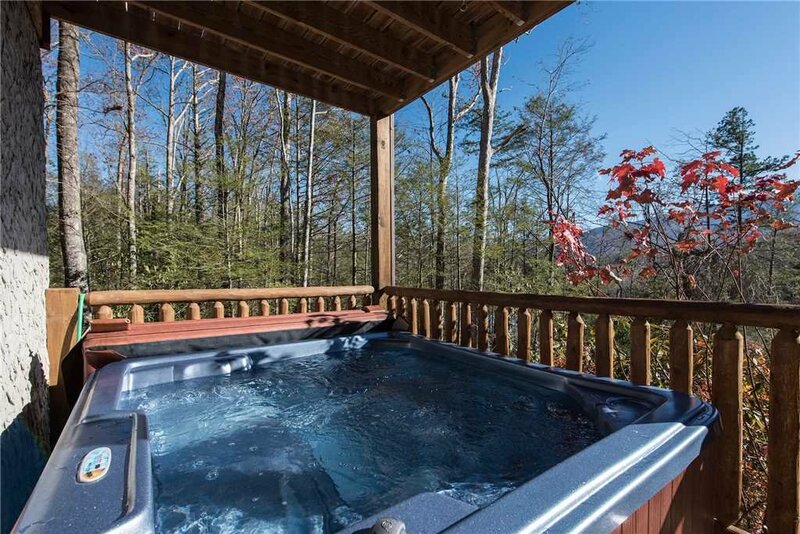 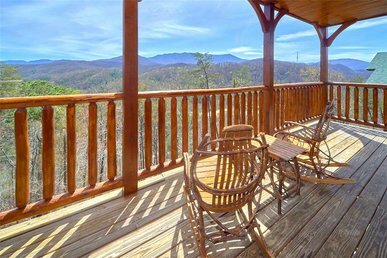 Rocky Top Lookout is a perfect home base for your best getaway yet. 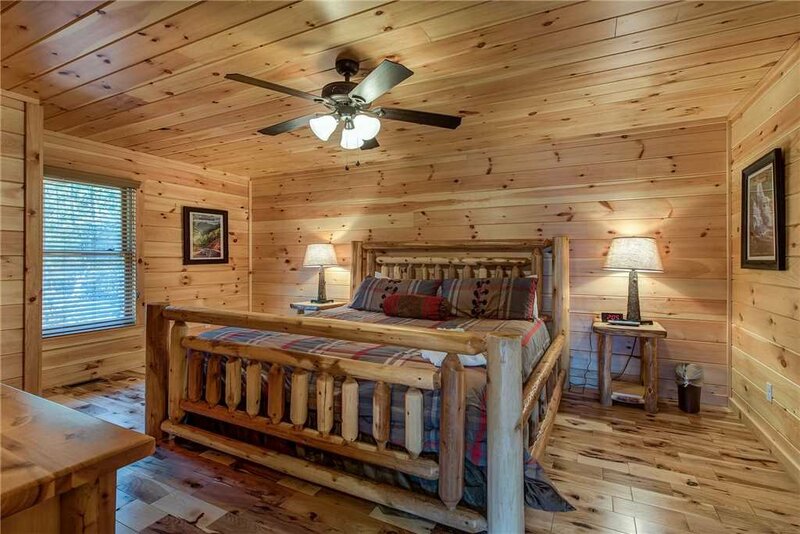 So book your stay today—before somebody else beats you to it!